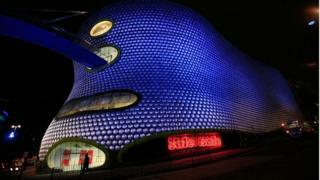 Shopping centre owner Hammerson, which owns Birmingham's famous Bullring, has agreed a £3.4bn takeover of rival Intu. The deal will create the UK's biggest property company, worth £21bn. Intu owns the Lakeside shopping centre, in Essex. and the Trafford Centre, in Manchester, while Hammerson owns Bicester Village designer outlet and London's Brent Cross shopping centre. Shares in Intu jumped by nearly 19% on the news, while Hammerson's fell by 3%. At market close, Intu shares were trading up 13.6% at 226p, while Hammerson's was down 6.2% to trade at 501.5p. The combined group plans to target fast growing markets in Spain and Ireland. John Strachan, chairman of Intu, said: "Intu offers high-quality retail and leisure destinations in the UK and Spain, which, when merged with Hammerson's own top-quality assets in the UK, in France and in Ireland, present a highly attractive proposition for retailers and shoppers in Europe's leading cities." Hammerson chairman David Tyler said: "This transaction will deliver real value for shareholders. The financial strength of the enlarged group and its strong leadership team will make it well-placed to take advantage of higher growth opportunities on a pan-European scale." Hammerson shareholders will own 55% of the combined firm and Intu investors the rest. Shareholders will vote on the deal next year. The combined group would be led by Hammerson chief executive David Atkins and chaired by Mr Tyler. Russ Mould, AJ Bell investment director, described Hammerson's takeover of Intu as "dramatic, given how terribly Intu's shares have gone down this year, amid fears over not just what Brexit may do to consumer confidence but also the fate of bricks-and-mortar retailers at the hands of Amazon and other online rivals". The union of Hammerson and Intu - the company formerly known as Capital Shopping Centres - has been the Holy Grail of property investment for more than a decade. The relative underperformance on Intu shares, which have at times traded at a discount to book value as high as 50%, has brought an opportunity for David Atkins, Hammerson's ambitious chief executive. The other key factor was the willingness of John Whittaker, the secretive billionaire who was the big shareholder in Intu, to come to the table. The end result is a shopping centre monster - £21bn worth of assets across Europe - that will quickly weed out underperforming properties once the deal is done. GlobalData retail analyst Sofie Willmott said the deal would give the combined group a stake in 12 of the 20 UK super-malls - large shopping centres of more than 20 million sq ft that attract more than 20 million customers a year. This "dominance" would "bolster the group's negotiating power with both retailers and leisure operators", she added, and help Hammerson to compete better with rival Westfield. According to GlobalData forecasts, spending growth in supermalls is due to outstrip overall spending growth in bricks-and-mortar stores over the next five years. Ms Willmott said she expected the enlarged group to "prioritise" supermall development. "As clothing and footwear retailers focus on super-malls to create large-scale, experience-led stores, physical retail spend will move away from town centres towards destination shopping centres, ensuring supermalls space is hot property," she said. "The proposed deal will net the group a stake in almost 60% of all UK supermalls space, making it a force in the retail landscape, well placed to benefit from retail spend shifting across locations."